Perfect for removing surface dirt and maintaining the clean looks of floors. Water only mode eliminates the impact of detergents on the environment and lowers cleaning costs. It’s the greenest, most economical way to clean. The tough cleaning you expect. 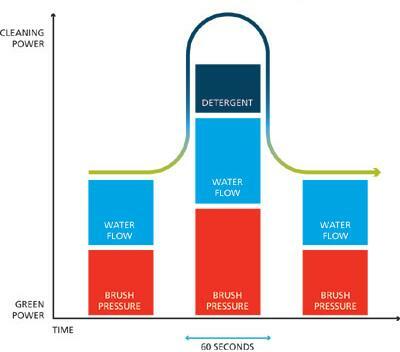 At the standard detergent dilution, brush pressure and flow rate. You’ll have a combination powerful enough to pull stubborn dirt from grout and porous surfaces. Green or not, sometimes an extra effort is required for deep, restorative cleaning or unexpected challenges. Ecoflex’s burst of power temporarily maximises brush pressure, water and detergent for a single powerful cleaning boost at the touch of a button.